Some local opposition to nuclear power emerged in the early 1960s,  and in the late 1960s some members of the scientific community began to express their concerns. In the early 1970s, there were large protests about a proposed nuclear power plant in Wyhl, West Germany. The project was cancelled in 1975 and anti-nuclear success at Wyhl inspired opposition to nuclear power in other parts of Europe and North America. Nuclear power became an issue of major public protest in the 1970s  and while opposition to nuclear power continues, increasing public support for nuclear power has re-emerged over the last decade in light of growing awareness of global warming and renewed interest in all types of clean energy (see the Pro-nuclear movement). A protest against nuclear power occurred in July 1977 in Bilbao, Spain, with up to 200,000 people in attendance. 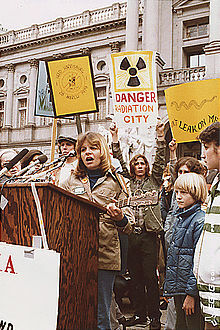 Following the Three Mile Island accident in 1979, an anti-nuclear protest was held in New York City, involving 200,000 people. In 1981, Germany's largest anti-nuclear power demonstration took place to protest against the Brokdorf Nuclear Power Plant west of Hamburg; some 100,000 people came face to face with 10,000 police officers. The largest protest was held on June 12, 1982, when one million people demonstrated in New York City against nuclear weapons. A 1983 nuclear weapons protest in West Berlin had about 600,000 participants. In May 1986, following the Chernobyl disaster, an estimated 150,000 to 200,000 people marched in Rome to protest against the Italian nuclear program. In the US, public opposition preceded the shutdown of the Shoreham, Yankee Rowe, Millstone 1, Rancho Seco, Maine Yankee, and many other nuclear power plants. The application of nuclear technology, as a source of energy and as an instrument of war, has been controversial. These issues are discussed in nuclear weapons debate, nuclear power debate, and uranium mining debate. The abandoned city of Prypiat, Ukraine, following the April 1986 Chernobyl disaster. The Chernobyl nuclear power plant is in the background. Nuclear proliferation: a concern that some types of nuclear reactor designs use and/or produce fissile material which could be used in nuclear weapons. Attacks on nuclear plants: a concern that nuclear facilities could be targeted by terrorists or criminals. 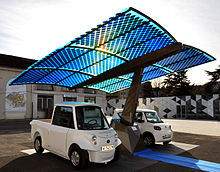 Photovoltaic SUDI shade is an autonomous and mobile station in France that provides energy for electric vehicles using solar energy. In 2014 global wind power capacity expanded 16% to 369,553 MW. Yearly wind energy production is also growing rapidly and has reached around 4% of worldwide electricity usage,  11.4% in the EU,  and it is widely used in Asia, and the United States. In 2014, worldwide installed photovoltaics capacity increased to 177 gigawatts (GW), sufficient to supply 1 percent of global electricity demands. Solar thermal energy stations operate in the United States and Spain, and as of 2016, the largest of these is the 392 MW Ivanpah Solar Electric Generating System in California. The world's largest geothermal power installation is The Geysers in California, with a rated capacity of 750 MW. Brazil has one of the largest renewable energy programs in the world, involving production of ethanol fuel from sugar cane, and ethanol now provides 18% of the country's automotive fuel. Ethanol fuel is also widely available in the United States. 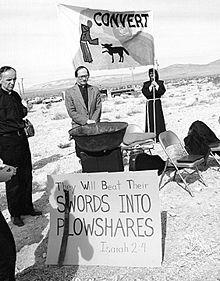 Members of Nevada Desert Experience hold a prayer vigil during the Easter period of 1982 at the entrance to the Nevada Test Site. Global Initiative to Combat Nuclear Terrorism, an international partnership of 83 nations. National and local anti-nuclear groups are listed at Anti-nuclear groups in the United States and List of anti-nuclear groups. Anti-nuclear power movement's Smiling Sun logo: "Nuclear Power? No Thanks"
On 12 December 1982, 30,000 women held hands around the 6 miles (9.7 km) perimeter of the base, in protest against the decision to site American cruise missiles there. Buddhist monks of Nipponzan-Myōhōji protest against nuclear power near the Diet of Japan in Tokyo on 5 April 2011. On 9 December 1982, Norman Mayer, an American anti–nuclear weapons activist, was shot and killed by the United States Park Police after threatening to blow up the Washington Monument, Washington, D.C., unless a national dialogue on the threat of nuclear weapons was seriously undertaken. Beginning in the 1950s, anti-nuclear ideas received coverage in the popular media with novels such as Fail-Safe and feature films such as Godzilla (1954), Dr. Strangelove or: How I Learned to Stop Worrying and Love the Bomb (1964), The China Syndrome (1979), Silkwood (1983), and The Rainbow Warrior (1992). Dark Circle is a 1982 American documentary film that focuses on the connections between the nuclear weapons and the nuclear power industries, with a strong emphasis on the individual human and protracted U.S. environmental costs involved. A clear point made by the film is that while only two bombs were dropped on Japan, many hundreds were exploded in the United States. The film won the Grand Prize for documentary at the Sundance Film Festival and received a national Emmy Award for "Outstanding individual achievement in news and documentary." For the opening scenes and about half of its length, the film focuses on the Rocky Flats Plant and its plutonium contamination of the area's environment. Musicians United for Safe Energy (MUSE) was a musical group founded in 1979 by Jackson Browne, Graham Nash, Bonnie Raitt, and John Hall, following the Three Mile Island nuclear accident. The group organized a series of five No Nukes concerts held at Madison Square Garden in New York City in September 1979. On September 23, 1979, almost 200,000 people attended a large anti-nuclear rally staged by MUSE on the then-empty north end of the Battery Park City landfill in New York. The album No Nukes, and a film, also titled No Nukes, were both released in 1980 to document the performances. The Bulletin of the Atomic Scientists is a nontechnical online magazine that has been published continuously since 1945, when it was founded by former Manhattan Project physicists after the atomic bombings of Hiroshima and Nagasaki. The Bulletin's primary aim is to inform the public about nuclear policy debates while advocating for the international control of nuclear weapons. One of the driving forces behind the creation of the Bulletin was the amount of public interest surrounding atomic energy at the dawn of the atomic age. In 1945 the public interest in atomic warfare and weaponry inspired contributors to the Bulletin to attempt to inform those interested about the dangers and destruction that atomic war could bring about. In the 1950s, the Bulletin was involved in the formation of the Pugwash Conferences on Science and World Affairs, annual conferences of scientists concerned about nuclear proliferation. On 26 February 1990, FW de Klerk issued orders to terminate the country's nuclear weapons programme, which until then had been a state secret. South Africa becomes the first country in the world to voluntary give-up its nuclear weapons programme. ^ a b c Herbert P. Kitschelt. Political Opportunity and Political Protest: Anti-Nuclear Movements in Four Democracies British Journal of Political Science, Vol. 16, No. 1, 1986, p. 71. ^ a b Fox Butterfield. Professional Groups Flocking to Antinuclear Drive, The New York Times, 27 March 1982. ^ a b William A. Gamson and Andre Modigliani. Media Coverage and Public Opinion on Nuclear Power Archived 24 March 2012 at Archive.today, American Journal of Sociology, Vol. 95, No. 1, July 1989, p. 7. ^ a b John Barry and E. Gene Frankland, International Encyclopedia of Environmental Politics, 2001, p. 24. ^ a b Jerry Brown and Rinaldo Brutoco (1997). Profiles in Power: The Anti-nuclear Movement and the Dawn of the Solar Age, Twayne Publishers, pp. 191–192. ^ a b Wolfgang Rudig (1990). Anti-nuclear Movements: A World Survey of Opposition to Nuclear Energy, Longman, p. 54-55. ^ a b Paula Garb. Review of Critical Masses, Journal of Political Ecology, Vol 6, 1999. ^ a b Wolfgang Rudig (1990). Anti-nuclear Movements: A World Survey of Opposition to Nuclear Energy, Longman, p. 52. ^ a b c d Stephen C. Mills; Roger Williams (1986). Public Acceptance of New Technologies: An International Review. Croom Helm. pp. 375–376. ISBN 978-0-7099-4319-8. ^ a b c Robert Gottlieb (2005). Forcing the Spring: The Transformation of the American Environmental Movement. Island Press. p. 237. ISBN 978-1-59726-761-8. ^ a b Jim Falk (1982). Global Fission: The Battle Over Nuclear Power, Oxford University Press, pp. 95–96. ^ Leo Hickman (28 November 2012). "Nuclear lobbyists wined and dined senior civil servants, documents show". The Guardian. ^ a b Jonathan Leake. "The Nuclear Charm Offensive" New Statesman, 23 May 2005. ^ a b Union of Concerned Scientists. Nuclear Industry Spent Hundreds of Millions of Dollars Over the Last Decade to Sell Public, Congress on New Reactors, New Investigation Finds Archived 27 November 2013 at the Wayback Machine News Center, February 1, 2010. ^ a b Nuclear group spent $460,000 lobbying in 4Q Archived 23 October 2012 at the Wayback Machine Business Week, March 19, 2010. ^ a b "Japan crisis rouses anti-nuclear passions globally". Washington Post. 16 March 2011. Archived from the original on 18 January 2012. ^ a b "Nuclear power: When the steam clears". The Economist. 24 March 2011. ^ a b c d Duroyan Fertl (5 June 2011). "Germany: Nuclear power to be phased out by 2022". Green Left. ^ Erika Simpson and Ian Fairlie, Dealing with nuclear waste is so difficult that phasing out nuclear power would be the best option, Lfpress, February 26, 2016. ^ a b "Difference Engine: The nuke that might have been". The Economist. 11 November 2013. ^ a b c James Kanter (25 May 2011). "Switzerland Decides on Nuclear Phase-Out". The New York Times. ^ "Sunday Dialogue: Nuclear Energy, Pro and Con". The New York Times. 25 February 2012. ^ Union-Tribune Editorial Board (27 March 2011). "The nuclear controversy". Union-Tribune. ^ a b Robert Benford. The Anti-nuclear Movement (book review) American Journal of Sociology, Vol. 89, No. 6, (May 1984), pp. 1456–1458. ^ James J. MacKenzie. Review of The Nuclear Power Controversy by Arthur W. Murphy The Quarterly Review of Biology, Vol. 52, No. 4 (Dec., 1977), pp. 467–468. ^ a b Walker, J. Samuel (2006). Three Mile Island: A Nuclear Crisis in Historical Perspective. University of California Press. pp. 10–11. ISBN 978-0-520-24683-6. ^ Jim Falk (1982). Global Fission: The Battle Over Nuclear Power, Oxford University Press. ^ Woo, Elaine (30 January 2011). "Dagmar Wilson dies at 94; organizer of women's disarmament protesters". Los Angeles Times. ^ Hevesi, Dennis (23 January 2011). "Dagmar Wilson, Anti-Nuclear Leader, Dies at 94". The New York Times. ^ Togzhan Kassenova (28 September 2009). "The lasting toll of Semipalatinsk's nuclear testing". Bulletin of the Atomic Scientists. ^ a b Frida Berrigan. The New Anti-Nuclear Movement Foreign Policy in Focus, April 16, 2010. ^ Philip Yam. Nuclear Exchange, Scientific American, June 2010, p. 24. ^ Alan Robock and Owen Brian Toon. Local Nuclear War, Global Suffering, Scientific American, January 2010, p. 74-81. ^ "Cour internationale de Justice - International Court". www.icj-cij.org. Archived from the original on 3 December 2013. Retrieved 7 May 2013. ^ Hugh Gusterson (30 March 2012). "The new abolitionists". Bulletin of the Atomic Scientists. Archived from the original on 6 June 2013. ^ "Nuclear endgame: The growing appeal of zero". The Economist. 16 June 2011. ^ Richard Schiffman (12 March 2013). "Two years on, America hasn't learned lessons of Fukushima nuclear disaster". The Guardian. ^ Martin Fackler (1 June 2011). "Report Finds Japan Underestimated Tsunami Danger". The New York Times. ^ Sustainable Development Commission. Is Nuclear the Answer? Archived 22 March 2014 at the Wayback Machine p. 12. ^ a b Richard Black (25 November 2011). "Nuclear power 'gets little public support worldwide'". BBC News. ^ M.V. Ramana (July 2011). "Nuclear power and the public". Bulletin of the Atomic Scientists. 67 (4): 44. doi: 10.1177/0096340211413358. ^ Mark Cooper (July 2011). "The implications of Fukushima: The US perspective". Bulletin of the Atomic Scientists. 67 (4): 9. doi: 10.1177/0096340211414840. ^ Bibi van der Zee (22 March 2011). "Japan nuclear crisis puts UK public off new power stations". The Guardian. ^ Matthew L. Wald. Edging Back to Nuclear Power The New York Times, April 21, 2010. ^ M. V. Ramana (July 2011). "Nuclear power and the public". Bulletin of the Atomic Scientists. 67 (4): 47–48. doi: 10.1177/0096340211413358. ^ M.V. Ramana (July 2011). "Nuclear power and the public". Bulletin of the Atomic Scientists. 67 (4): 46. doi: 10.1177/0096340211413358. ^ M. V. Ramana (July 2011). "Nuclear power and the public". Bulletin of the Atomic Scientists. 67 (4): 48. doi: 10.1177/0096340211413358. ^ Kurt Kleiner. Nuclear energy: assessing the emissions Nature Reports, Vol. 2, October 2008, pp. 130–131. ^ Mark Diesendorf (2007). Greenhouse Solutions with Sustainable Energy, University of New South Wales Press, p. 252. ^ Hanna Gersmann (10 November 2011). "EDF fined €1.5m for spying on Greenpeace". The Guardian. Retrieved 11 November 2011. ^ Contesting the Future of Nuclear Power, Non-Nuclear Futures, Reaction Time. ^ Deutsche Welle (28 June 2005). "France Wins Nuclear Fusion Plant". dw.com. ^ Jim Green (2012). "New Reactor Types – pebble bed, thorium, plutonium, fusion". Friends of the Earth. ^ World Nuclear Association (2005). "Nuclear Fusion Power". ^ W Wayt Gibbs (30 December 2013). "Triple-threat method sparks hope for fusion". Nature. 505 (7481): 9–10. doi: 10.1038/505009a. ^ Jim Green. "Medical radioisotope supply options for Australia". Friends of the Earth. ^ Robert F. Service (20 February 2012). "Nuclear Reactors Not Needed to Make the Most Common Medical Isotope". Science Now. ^ Cartlidge, E. (2011). "Saving for a Rainy Day". Science. 334 (6058): 922–924. doi: 10.1126/science.334.6058.922. ^ Greenpeace International and European Renewable Energy Council (January 2007). Energy Revolution: A Sustainable World Energy Outlook Archived 6 August 2009 at the Wayback Machine, p. 7. ^ International Energy Agency (2007). Renewables in global energy supply: An IEA facts sheet (PDF) OECD, 34 pages. ^ Lester R. Brown. Plan B 4.0: Mobilizing to Save Civilization, Earth Policy Institute, 2009, p. 135. ^ "GWEC Global Wind Statistics 2014" (PDF). GWEC. 10 February 2015. ^ The World Wind Energy Association (2014). 2014 Half-year Report. WWEA. pp. 1–8. ^ "Wind in power: 2015 European statistics- EWEA" (PDF). ^ Tam Hunt (9 March 2015). "The Solar Singularity Is Nigh". Greentech Media. Retrieved 29 April 2015. ^ "World largest solar thermal plant syncs to the grid". Spectrum.ieee.org. 26 September 2013. Retrieved 28 November 2014. ^ "World's Largest Solar Thermal Power Project at Ivanpah Achieves Commercial Operation", NRG press release, February 13, 2014. ^ Mark A. Delucchi and Mark Z. Jacobson (2011). "Providing all global energy with wind, water, and solar power, Part II: Reliability, system and transmission costs, and policies" (PDF). Energy Policy. Elsevier Ltd. pp. 1170–1190. ^ Clack, Christopher T. M.; Qvist, Staffan A.; Apt, Jay; Bazilian, Morgan; Brandt, Adam R.; Caldeira, Ken; Davis, Steven J.; Diakov, Victor; Handschy, Mark A. (27 June 2017). "Evaluation of a proposal for reliable low-cost grid power with 100% wind, water, and solar". Proceedings of the National Academy of Sciences. 114 (26): 6722–6727. Bibcode: 2017PNAS..114.6722C. doi: 10.1073/pnas.1610381114. ISSN 0027-8424. PMC 5495221. PMID 28630353. ^ Herbert P. Kitschelt. Political Opportunity and Political Protest: Anti-Nuclear Movements in Four Democracies British Journal of Political Science, Vol. 16, No. 1, 1986, p. 67. ^ Wolfgang Rudig (1990). Anti-nuclear Movements: A World Survey of Opposition to Nuclear Energy, Longman, p. 1. ^ Lutz Mez, Mycle Schneider and Steve Thomas (Eds.) (2009). International Perspectives of Energy Policy and the Role of Nuclear Power, Multi-Science Publishing Co. Ltd, p. 279. ^ Matthew L. Wald. Nuclear Agency's Chief Praises Watchdog Groups, The New York Times, June 23, 1992. ^ a b c Lawrence S. Wittner (2009). Confronting the Bomb: A Short History of the World Nuclear Disarmament Movement, Stanford University Press, pp. 164–165. ^ "About Friends of the Earth International". Friends of the Earth International. Archived from the original on 4 May 2009. Retrieved 2009-06-25. ^ Harrabin, Roger (12 September 2014). "FOE shift on nuclear power". the Guardian. ^ "Join the Movement". Archived from the original on 8 February 2018. Retrieved 14 April 2019. ^ "DPI/NGO Directory". www.un.org. United Nations, Department of Public Information, Non-Governmental Organizations. ^ "Greenpeace International: Greenpeace worldwide". ^ Henry Mhara (17 October 2011). "Coltart elected anti-nuclear organisation president". News Day. ^ a b c Lawrence S. Wittner (2009). Confronting the Bomb: A Short History of the World Nuclear Disarmament Movement, Stanford University Press, p. 128. ^ Lawrence S. Wittner (2009). Confronting the Bomb: A Short History of the World Nuclear Disarmament Movement, Stanford University Press, p. 125. ^ World's best-known protest symbol turns 50, BBC News, 20 March 2008. ^ a b Deutsche Welle. 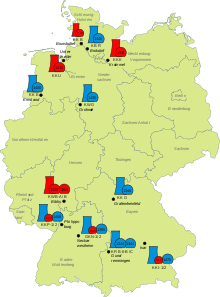 "Nuclear Power in Germany: A Chronology". DW.COM. ^ Paul Lewis. David McTaggart, a Builder of Greenpeace, Dies at 69 The New York Times, March 24, 2001. ^ a b c d e f Lawrence S. Wittner. Nuclear Disarmament Activism in Asia and the Pacific, 1971–1996 The Asia-Pacific Journal, Vol. 25–5–09, June 22, 2009. ^ Lutz Mez, Mycle Schneider and Steve Thomas (Eds.) (2009). International Perspectives of Energy Policy and the Role of Nuclear Power, Multi-Science Publishing Co. Ltd, p. 371. ^ Wolfgang Rudig (1990). Anti-nuclear Movements: A World Survey of Opposition to Nuclear Energy, Longman, p. 138. ^ Dorothy Nelkin and Michael Pollak (1982). The Atom Besieged: Antinuclear Movements in France and Germany, ASIN: B0011LXE0A, p. 3. ^ Yok-shiu F. Lee; Alvin Y. So (1999). Asia's Environmental Movements: Comparative Perspectives. M.E. Sharpe. pp. 160–161. ISBN 978-1-56324-909-9. ^ West Germans Clash at Site of A-Plant The New York Times, March 1, 1981 p. 17. ^ Lawrence S. Wittner. "Disarmament movement lessons from yesteryear". 27 July 2009. Bulletin of the Atomic Scientists, 27 July 2009. ^ Paul Brown, Shyama Perera and Martin Wainwright. Protest by CND stretches 14 miles The Guardian, 2 April 1983. ^ John Greenwald. Energy and Now, the Political Fallout, TIME, June 2, 1986. ^ Marco Giugni (2004). Social Protest and Policy Change: Ecology, Antinuclear, and Peace Movements in Comparative Perspective. Rowman & Littlefield. p. 55. ISBN 978-0-7425-1827-8. ^ Hundreds of Marchers Hit Washington in Finale of Nationwide Peace March Gainesville Sun, November 16, 1986. ^ "Semipalatinsk: 60 years later (collection of articles)". Bulletin of the Atomic Scientists. September 2009. Archived from the original on 14 October 2009. Retrieved 1 October 2009. ^ World: Asia-Pacific: Kazakh anti-nuclear movement celebrates tenth anniversary BBC News, February 28, 1999. ^ Matthew Chance. Inside the nuclear underworld: Deformity and fear CNN.com, August 31, 2007. ^ Nuclear-Free Future Award. "World Uranium Hearing, a Look Back". Archived from the original on 3 June 2013. ^ Nuclear-Free Future Award. "The Declaration of Salzberg". Archived from the original on 23 September 2012. ^ Giugni, Marco (2004). Social Protest and Policy Change: Ecology, Antinuclear, and Peace Movements in Comparative Perspective. Rowman & Littlefield. p. 44. ISBN 978-0-7425-1827-8. ^ Giugni, Marco (2004). Social Protest and Policy Change: Ecology, Antinuclear, and Peace Movements in Comparative Perspective. Rowman & Littlefield. p. 45. ISBN 978-0-7425-1827-8. ^ a b Herman, Robin (24 September 1979). "Nearly 200,000 Rally to Protest Nuclear Energy". The New York Times. p. B1. ^ Williams, Estha. Nuke Fight Nears Decisive Moment Valley Advocate, August 28, 2008. ^ Harvey Klehr (1988). Far Left of Center: The American Radical Left Today. Transaction Publishers. p. 150. ISBN 978-1-4128-2343-2. ^ Hundreds of Marchers Hit Washington in Finale of Nationwaide Peace March Gainesville Sun, November 16, 1986. ^ Robert Lindsey. 438 Protesters are Arrested at Nevada Nuclear Test Site The New York Times, February 6, 1987. ^ 493 Arrested at Nevada Nuclear Test Site The New York Times, April 20, 1992. ^ a b Lance Murdoch. Pictures: New York MayDay anti-nuke/war march Archived 28 July 2011 at the Wayback Machine IndyMedia, 2 may 2005. ^ a b Anti-Nuke Protests in New York Archived 31 October 2010 at the Wayback Machine Fox News, May 2, 2005. ^ a b Protest against nuclear reactor Chicago Tribune, October 16, 2008. ^ a b Southeast Climate Convergence occupies nuclear facility Indymedia UK, August 8, 2008. ^ a b "Anti-Nuclear Renaissance: A Powerful but Partial and Tentative Victory Over Atomic Energy". ^ Mark Cooper (18 June 2013). "Nuclear aging: Not so graceful". Bulletin of the Atomic Scientists. ^ a b Matthew Wald (14 June 2013). "Nuclear Plants, Old and Uncompetitive, Are Closing Earlier Than Expected". The New York Times. ^ Diane Farseta (1 September 2008). "The Campaign to Sell Nuclear". Bulletin of the Atomic Scientists. 64 (4): 38–56. doi: 10.2968/064004009. ^ Thousands march in Paris anti-nuclear protest ABC News, January 18, 2004. ^ a b c Lawrence S. Wittner. A rebirth of the anti-nuclear weapons movement? Portents of an anti-nuclear upsurge Archived 19 June 2010 at the Wayback Machine Bulletin of the Atomic Scientists, 7 December 2007. ^ "French protests over EPR". Nuclear Engineering International. 3 April 2007. Archived from the original on 27 September 2007. ^ "France hit by anti-nuclear protests". Evening Echo. 3 April 2007. Archived from the original on 29 September 2007. ^ "Thousands protest against Indonesian nuclear plant". ABC News. 12 June 2007. ^ "Japan Nuclear Plant Not Safe to Restart After Quake, Group Says". Bloomberg News. ^ CNIC (Citizens' Nuclear Information Center). "Close Kazantzakis-Kariwa Nuclear Plant". cnic.jp. ^ "International Conference on Nuclear Disarmament". February 2008. Archived from the original on 4 January 2011. ^ The Renaissance of the Anti-Nuclear Movement Spiel Online, 11/10/2008. 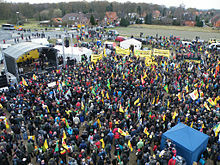 ^ Anti-Nuclear Protest Reawakens: Nuclear Waste Reaches German Storage Site Amid Fierce Protests Spiel Online, 11/11/2008. ^ Simon Sturdiness. Police break up German nuclear protest The Age, November 11, 2008. ^ Green boost in European elections may trigger nuclear fight, Nature, 9 June 2009. ^ More than 30 arrests at Aldermaston anti-nuclear protest The Guardian, 28 October 2008. ^ Maryann Spoto. 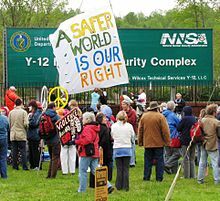 Nuclear license renewal sparks protest Star-Ledger, June 02, 2009. ^ Anti-nuclear protesters reach capitol[ dead link] Rutland Herald, January 14, 2010. ^ Eric Kirschbaum. Anti-nuclear rally enlivens German campaign Reuters, September 5, 2009. ^ 50,000 join anti-nuclear power march in Berlin The Local, September 5, 2009. ^ Roger Boyes. German nuclear programme threatened by old mine housing waste The Times, January 22, 2010. ^ "Groups say new Vogyle Reactors need study". August Chronicle. Archived from the original on 7 July 2011. Retrieved 24 April 2010. ^ "German nuclear protesters form 75-mile human chain". Reuters. 25 April 2010. Archived from the original on 27 April 2010. Retrieved 25 April 2010. ^ A-bomb survivors join 25,000-strong anti-nuclear march through New York Archived 12 May 2013 at the Wayback Machine Mainichi Daily News, May 4, 2010. ^ James Norman and Dave Sweeney. Germany's 'hot autumn' of nuclear discontent Sydney Morning Herald, September 14, 2010. ^ Dave Graham. Thousands of Germans attend anti-nuclear protest National Post, September 18, 2010. ^ Tens of thousands take part in Munich anti-nuclear protest Deutsche Welle, 9 October 2010. ^ Rachael Brown. Violent protests against nuclear waste train ABC News, November 8, 2010. ^ Atomic waste train back on move after anti-nuclear blockade Deutsche Welle, 5 November 2010. ^ Indians protest against nuclear plant (December 4, 2010) World News Australia. ^ Valdes, Manuel (December 13, 2010). Anti-nuclear weapon protesters convicted in Tacoma The Washington Post. ^ "Five Japanese in Hunger Strike Against Kaminoseki Nuclear Power Plant". 29 January 2011. ^ Stamp, David (14 March 2011). "Germany suspends deal to extend nuclear plants' life". Reuters. Retrieved 15 March 2011. ^ Knight, Ben (15 March 2011). "Merkel shuts down seven nuclear reactors". Deutsche Welle. Retrieved 15 March 2011. ^ James Kanter and Judy Dempsey (15 March 2011). "Germany Shuts 7 Plants as Europe Plans Safety Tests". The New York Times. ^ "Over 2,000 rally against nuclear plants in Taiwan". AFP. 20 March 2011. 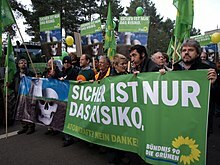 ^ "Anti-nuclear Germans protest on eve of state vote". Reuters. 26 March 2011. ^ Judy Dempsey (27 March 2011). "Merkel Loses Key German State on Nuclear Fears". The New York Times. ^ "Thousands of Germans protest against nuclear power". Bloomberg Businessweek. 2 April 2011. Archived from the original on 8 May 2011. ^ "Activists call for renewable energy at UN meeting". The Associated Press. 4 April 2011. ^ Krista Mahr (11 April 2011). "What Does Fukushima's Level 7 Status Mean?". Time. ^ Amanda Hodge (21 April 2011). "Fisherman shot dead in Indian nuke protest". The Australian. ^ "Biggest anti-nuclear Swiss protests in 25 years". Bloomberg Businessweek. 22 May 2011. Archived from the original on 26 October 2012. ^ "Anti-nuclear protests attract 20,000". Swissinfo. 22 May 2011. ^ Lee I-Chia (1 May 2011). "Anti-nuclear rally draws legions". Taipei Times. ^ Lee I-Chia (5 June 2011). "Conservationists protest against nuclear policies". Tapai Times. ^ Antoni Slodkowski (15 June 2011). "Japan anti-nuclear protesters rally after quake". Reuters. ^ "Fukushima farmers, fishermen protest over nuclear crisis". Mainichi Daily News. 13 August 2011. Archived from the original on 2 September 2011. ^ a b Olivier Fabre (11 September 2011). "Japan anti-nuclear protests mark 6 months since quake". Reuters. ^ "Thousands march against nuclear power in Tokyo". USA Today. September 2011. ^ a b c Siddharth Srivastava (27 October 2011). "India's Rising Nuclear Safety Concerns". Asia Sentinel. ^ Ranjit Devraj (25 October 2011). "Prospects Dim for India's Nuclear Power Expansion as Grassroots Uprising Spreads". Inside Climate News. ^ Mari Yamaguchi (6 September 2011). "Kenzaburo Oe, Nobel Winner Urges Japan To Abandon Nuclear Power". Huffington Post. ^ "Hinkley Point power station blockaded by anti-nuclear protesters". The Guardian. 3 October 2011. ^ ""We want a nuclear-free peaceful world" say South Korea's women". Women News Network. 13 January 2012. ^ "Protesting nuclear power". The Japan Times. 22 January 2012. ^ Elgan Hearn (25 January 2012). "Hundreds protest against nuclear power station plans". Online Mail. ^ "Austria expects EU anti-nuclear campaign this year". Reuters. 12 March 2012. ^ "About 2,000 Taiwanese stage anti-nuclear protest". Straits Times. 11 March 2011. ^ Phil Mercer (11 March 2012). "Australian Rallies Remember Fukushima Disaster". VOA News. Archived from the original on 12 March 2012. ^ "Antinuclear rally held in Seoul on eve of Japan quake anniversary". Mainichi Daily. 11 March 2012. Archived from the original on 19 July 2012. ^ "Nearly 200 arrested in India nuclear protest". France24. 20 March 2012. ^ "Oi prompts domestic, U.S. antinuclear rallies". The Japan Times. 24 June 2012. ^ "Thousands in Japan anti-nuclear protest two years after Fukushima". Reuters. 10 March 2013. ^ Yu-Huay Sun (11 March 2013). "Taiwan Anti-Nuclear Protests May Derail $8.9 Billion Power Plant". Bloomberg News. ^ "Thousands of anti-nuclear protesters attend Glasgow march against Trident". Daily Record. 13 April 2013. ^ Deutsche Welle. "Anti-nuclear protests in Taiwan draw tens of thousands". DW.COM. ^ Jennings, Ralph. "Taiwan Signals More Nuclear Power Despite Protests". ^ "Anti-nuclear rallies to take place islandwide on March 8 – Society – FOCUS TAIWAN – CNA ENGLISH NEWS". ^ "Taiwan to halt construction of fourth nuclear power plant". Reuters. 28 April 2014. ^ Newtan, Samuel Upton (2007). Nuclear War 1 and Other Major Nuclear Disasters of the 20th Century, AuthorHouse, p. 96. ^ WISE Paris. The threat of nuclear terrorism:from analysis to precautionary measures. 10 December 2001. ^ Indymedia UK. Activist Killed in Anti-nuke Protest. ^ Bosley Crowther. Movie Review: Dr. Strangelove (1964) The New York Times, January 31, 1964. ^ The China Syndrome (1979) The New York Times. ^ Dark Circle, DVD release date March 27, 2007, Directors: Judy Irving, Chris Beaver, Ruth Landy. ISBN 0-7670-9304-6. ^ "Mitsubashi no haoto to chikyū no kaiten". Cinema Today (in Japanese). Retrieved 1 December 2012. ^ "Mitsubashi no haoto to chikyū no kaiten Kawanaka Hitomi". Eiga Geijutsu (in Japanese). Retrieved 1 December 2012. ^ "Documentary Advances Nuclear Free Movement". NPR. Retrieved 10 June 2010. ^ ""For What It's Worth," No Nukes Reunite After Thirty Years". www.nukefree.org. ^ Weisberg, Sam. "Documentary "Off Country" Lets Survivors and Opponents of Nuclear Testing Do the Talking". Screen Comment. Retrieved 2 November 2017. ^ Boyer, Paul S. (1985). By the Bomb's Early Light. Pantheon. p. 70. ISBN 9780394528786. ^ Jim Doyle. Nuclear power industry sees opening for revival San Francisco Chronicle, March 9, 2009. ^ Minnesota House says no to new nuclear power plants Archived 5 May 2009 at the Wayback Machine StarTribune.com, April 30, 2009. ^ Rebecca A. McNerney (1998). Changing Structure of the Electric Power Industry: An Update. DIANE Publishing. p. 110. ISBN 978-0-7881-7363-9. ^ a b William A. Gamson and Andre Modigliani. Media Coverage and Public Opinion on Nuclear Power[ permanent dead link], American Journal of Sociology, Vol. 95, No. 1, July 1989, p. 15. ^ a b Research and Markets: International Perspectives on Energy Policy and the Role of Nuclear Power Reuters, May 6, 2009. ^ "Nuclear Free Zone, Disarmament, and Arms Control Act". canterbury.cyberplace.org.nz. ^ "Nuclear Energy Prospects in New Zealand". World Nuclear Association. April 2009. Archived from the original on 3 January 2010. Retrieved 9 December 2009. ^ "Nuclear power backed by 19%". Television New Zealand. 7 April 2008. Retrieved 16 September 2011. ^ eISB. "Electricity Regulation Act, 1999". www.irishstatutebook.ie. ^ "Navajo Nation outlaws". www.wise-uranium mining.org. ^ Mycle Schneider, Steve Thomas, Antony Froggatt, Doug Koplow (August 2009). The World Nuclear Industry Status Report, German Federal Ministry of Environment, Nature Conservation and Reactor Safety, p. 6. ^ Ralph Summy. Confronting the Bomb (book review), Social Alternatives, Vol. 28, No. 3, 2009, p. 64. ^ Jeremy Bernstein. Nukes for Sale The New York Review of Books, April 14, 2010. ^ "Italy puts 1 year moratorium on nuclear". Businessweek. 23 March 2011. ^ "Italy Nuclear Referendum Results". 13 June 2011. Archived from the original on 25 March 2012. ^ Annika Breidthardt (30 May 2011). "German government wants nuclear exit by 2022 at latest". Reuters. ^ a b c International Atomic Energy Agency (2005). Global Public Opinion on Nuclear Issues and the IAEA: Final Report from 18 Countries Archived 9 April 2008 at the Wayback Machine pp. 6–7. 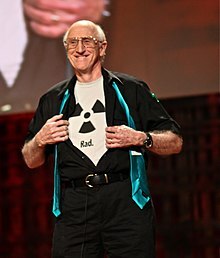 ^ "Stewart Brand + Mark Z. Jacobson: Debate: Does the world need nuclear energy?". TED. February 2010. Retrieved 21 October 2013. ^ van Munster R, Sylvest C. Pro-Nuclear Environmentalism: Should We Learn to Stop Worrying and Love Nuclear Energy? Technology and Culture, 2015 Oct 56(4):789–811. doi: 10.1353/tech.2015.0107. ^ a b c "James Lovelock: Nuclear power is the only green solution". www.ecolo.org. ^ a b Moore, Patrick (16 April 2006). "Going Nuclear" – via www.washingtonpost.com. ^ Cohen, Bernard L. "The Nuclear Energy Option". www.phyast.pitt.edu. ^ Brand, Stewart. "Environmental Heresies". ^ Tierney, John (27 February 2007). "Stewart Brand - John Tierney - An Early Environmentalist, Embracing New 'Heresies'". The New York Times. ^ Comby, Bruno. "James LOVELOCK's web site - the international homepage". www.ecolo.org. ^ a b Monbiot, George (21 March 2011). "Why Fukushima made me stop worrying and love nuclear power". The Guardian. Retrieved 22 March 2011. ^ Monbiot, George (4 April 2011). "Evidence Meltdown". The Guardian. Archived from the original on 9 April 2011. Retrieved 17 April 2011. Brown, Jerry and Rinaldo Brutoco (1997). Profiles in Power: The Anti-nuclear Movement and the Dawn of the Solar Age, Twayne Publishers. Byrne, John and Steven M. Hoffman (1996). Governing the Atom: The Politics of Risk, Transaction Publishers. Clarfield, Gerald H. and William M. Wiecek (1984). 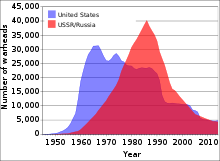 Nuclear America: Military and Civilian Nuclear Power in the United States 1940–1980, Harper & Row. Cooke, Stephanie (2009). In Mortal Hands: A Cautionary History of the Nuclear Age, Black Inc.
Cragin, Susan (2007). Nuclear Nebraska: The Remarkable Story of the Little County That Couldn’t Be Bought, AMACOM. Diesendorf, Mark (2009). Climate Action: A Campaign Manual for Greenhouse Solutions, University of New South Wales Press. Diesendorf, Mark (2007). Greenhouse Solutions with Sustainable Energy, University of New South Wales Press. Fradkin, Philip L. (2004). Fallout: An American Nuclear Tragedy, University of Arizona Press. Giugni, Marco (2004). Social Protest and Policy Change: Ecology, Antinuclear, and Peace Movements in Comparative Perspective, Rowman and Littlefield. Lowe, Ian (2007). Reaction Time: Climate Change and the Nuclear Option, Quarterly Essay. McCafferty, David P. (1991). The Politics of Nuclear Power: A History of the Shoreham Power Plant, Kluwer. Natti, Susanna and Bonnie Acker (1979). No Nukes: Everyone's Guide to Nuclear Power, South End Press. Newtan, Samuel Upton (2007). Nuclear War 1 and Other Major Nuclear Disasters of the 20th Century, AuthorHouse. Ondaatje, Elizabeth H. (c1988). Trends in Antinuclear Protests in the United States, 1984–1987, Rand Corporation. Parkinson, Alan (2007). Maralinga: Australia’s Nuclear Waste Cover-up, ABC Books. Pernick, Ron and Clint Wilder (2012). Clean Tech Nation: How the U.S. Can Lead in the New Global Economy. Peterson, Christian (2003). Ronald Reagan and Antinuclear Movements in the United States and Western Europe, 1981–1987, Edwin Mellen Press. Price, Jerome (1982). The Antinuclear Movement, Twayne Publishers. Rudig, Wolfgang (1990). Anti-nuclear Movements: A World Survey of Opposition to Nuclear Energy, Longman. Schneider, Mycle, Steve Thomas, Antony Froggatt, Doug Koplow (August 2009). The World Nuclear Industry Status Report, German Federal Ministry of Environment, Nature Conservation and Reactor Safety. Smith, Jennifer (Editor), (2002). The Antinuclear Movement, Cengage Gale. Sovacool, Benjamin K. (2011). Contesting the Future of Nuclear Power: A Critical Global Assessment of Atomic Energy, World Scientific. Surbrug, Robert (2009). Beyond Vietnam: The Politics of Protest in Massachusetts, 1974–1990, University of Massachusetts Press. Walker, J. Samuel (2004). Three Mile Island: A Nuclear Crisis in Historical Perspective, University of California Press. Wills, John (2006). Conservation Fallout: Nuclear Protest at Diablo Canyon, University of Nevada Press. Wittner, Lawrence S. (2009). Confronting the Bomb: A Short History of the World Nuclear Disarmament Movement, Stanford University Press. Wikimedia Commons has media related to Demonstrations and protests against nuclear power. The M and S Collection at the Library of Congress contains anti-nuclear movement materials.
" Make love, not war"